In logistic regression, the parameters are commonly estimated by using maximum likelihood estimator (MLE). However, MLE is easily affected when outliers appear in the data. The objective of this study is to compare the performance between the MLE and four robust methods namely the Mallows-type, Conditionally Unbiased Bounded Influence (CUBIF), Bianco and Yohai (BY), and Weighted Bianco and Yohai (WBY) which are available in R by applying to a sample of real dataset on potential divorce which contains outliers. The performance of the parameter estimators is determined by using the chi-square arcsine transformation with the best estimator having the smallest value. The result in this study found that the WBY method proved to be best robust method in estimating the parameters of potential divorce data. 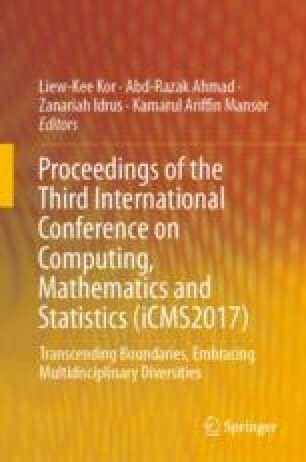 The authors wish to thank Universiti Teknologi MARA (UiTM) Shah Alam for providing the internal grant (600-IRMI/MyRA 5/3/LESTARI(0129/2016) and Syariah Lower Court for providing the data.